Except for the day you were born and the day you are supposed to die there is not a single event in ones life that cannot be forecast and if necessary, changed. You are born with a specific path. Divination serves as a road map to your path. Our ancestors exist and must be honored, respected and consulted. This page exists for the benefit of those who know nothing or very little about Ifaism/Yoruba, and at this moment find themselves in the Ifa Link. The Ifa Link is meant to inform not entertain, although many find it entertaining. The focus here is religion, something taken totally out of context in this day and time. Within this page I will attempt to explain the content of these expressive pages. However I will never fully understand it’s content. Ifaism is usually referred to as Yoruba. The name Yourba in Africa encompasses a group of people that speak the same language and live within certain boundaries. Now-a-days, many Yourbas know nothing about Ifa. The educational systems in America, by design, teach our children nothing about African history, culture, virtues and of course religion. The only history most Black Americans know about is American history where we started out as slaves and built America. Many Black Americans do not realize that if our slave masters were not Christians then our most recent Ancestors wouldn’t have been. By no means am I trying to impose my worldview on you. This tactic was devised to control the many for the benefit of the few. Religion is a personal relationship that you, and only you, have with God. Only you are held accountable for what you have and have not done on earth. At the end of the day, it’s only you (Ori). When you laugh the whole world laughs with you, when you cry you cry alone. It is obvious that every one of us is different. We exist here on earth expressing our different attitudes and energies. We each strive on a daily basis to better our sojourn here on earth. Ifa is the medium with which our individual strengths are expounded upon enabling us to express our different attitudes in harmony with one another. Ifa is also a means of exposing the weaknesses we have that block our path to success, happiness and longevity. Before there was any sort of writing there was Ifa. Ifa at this time, of course, was oral. In Africa, specific individuals spent their entire life, from childhood, learning Ifa verses. These verses number in the thousands and express every single facet and possibility in life. Ifa verses cover the creation of this earth, the creation of every animal species, man and even this computer. Ifa is the totality of our earthly and heavenly realms and gives us a direct and individual phone number to God. The Orisa are manifestations of God created to help us understand each piece of life’s puzzle. Ifa helps us put the pieces together and identify which piece we represent. In other words, knowing exactly who you are and what your destiny is makes achieving your goals fundamental. This information enables us to avoid trial-by-error, which causes so much vanity and frustration in our lives. The Orisa are all within Ifa and serve as an individual focal point for our prayers and aspirations. The differences between the 401+ Orisa serve as a spiritual medium that is suitable for our individual attitudes. Ifa assists us in identifying which Orisa force to align ourselves with, thereby increasing our chances for true success. The Orisa (forces of nature) live within us and deal with the affairs of men. You must never initiate harm to another human being or to the universe, which you are apart of. Spiritual, physical, mental, and emotional realms of our existence must all work together and be balanced. Culture is expressed via years of learned behavior. It is expressed through our children via external stimuli and internal Eguns (ancestors) or guardians (Orisa). The internal and external realms of our existence must constantly be balanced. The synchronization of the two results in the acquisition of material wealth and good character. Regardless of who you are, or what you believe in, the key to success in this life and beyond is exemplifying good character and harmony amongst each other. African people have been ostracized from inherent greatness in many arenas, most of which are now expressed externally (physically). We must now make strides to balance the scales. Our spiritual (internal) composition is as complex as our physical one. This “new age” culture that the African has been exposed to for the last 400 years or so has effectively alienated us from the science we once used to achieve the equilibrium I’m expressing. Within Cultural Expressions the holy Odu Osa-Tura solidifies the two realms. The physical realm, which is comprised of the physical computer, and the spiritual realm which is comprised of the spiritual computer (Ifa). We as a people are learning most of our lessons the hard way, for the lack of the proper guidance of our spiritual and physical energy. Because of this, we very often get to the crossroad and make the wrong turn. The inner science that we have inherited lies dormant in most of our lives. We too often rely on our human instincts (emotion), hence we make improperly judged decisions. Everything we go through in life has been done already. Is it not logical to learn from the mistakes of others instead of you yourself having to live it and then learn? In the Beginning, Olodumare (God) gave the Orisa Orunmila a flawless method of communication between himself and the Orisa called Ifa. Ifa is linked to destiny through the symbolism of the number sixteen. Sixteen is the number of cosmos; it represents the primal order that issued from the unity of Olodumare. (Sixteen is also a significant number in the world of computers.) When the world was first created, it spread out from an original palm tree that stood at the center of the world at Ile-Ife. The palm tree had sixteen branches, which formed the four cardinal points and the sixteen original quarters of Ile-Ife. In political terms, Odudua, the first oni of Ife, fathered sixteen sons who founded the sixteen original kingdoms of the Yoruba. On a deeper level still, Orunmila taught the art of divination to his sixteen sons; they, in turn, passed it down to the Babalawos who practice it today. Through the linked concepts of order, creation, and destiny, the number sixteen represents the variables of the human condition, the sixteen possible situations of human life. For the Yoruba, the sixteen principle signs are called Odu or Olodu, from each of which are drawn sixteen subordinate signs (omo-Odu, “children of the odu” or Odus). These represent the sixteen essential life situations with sixteen possible variations each. This means 256 possible combinations (Odu’s) or two to the eighth power. Each Odu is a recital of a set of poems called ese, that provide clues for the resolution of the problem during a divination session. There are at least, and by far not the most, 16 different ese’s for each of the 256 Odu. This adds up to at least 4096 different scenarios. The goal of the Babalawo is to arrive at the appropiate Odu for the situation of his “querent”. Each of the 256 Odu reveals an archetypal situation that was resolved in the mythic past through sacrifice to an Orisa. 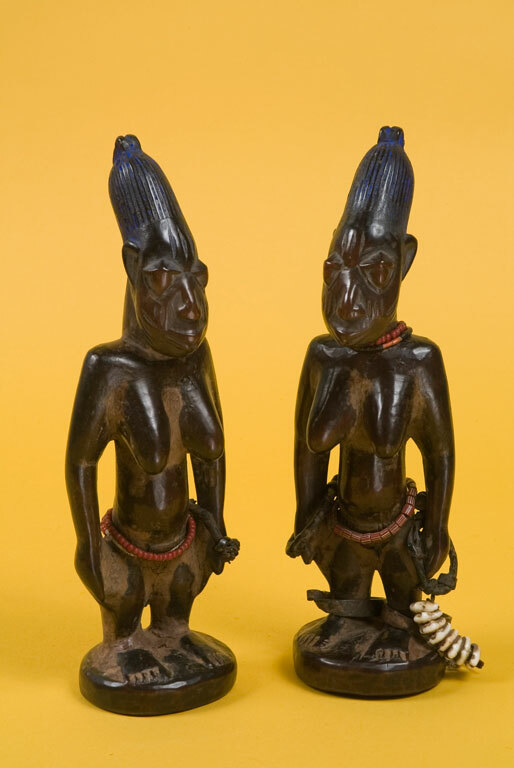 In the thousands of Ifa poems, the Orisa are organized into a community of spirits whose ase (power) can can be brought to bear on the problems of individual men and women in need. In this way, Ifa and the Babalawo priesthood are responsible for directing the adherents of all the Orisa’s by leading querents to them. Nearly all the sacrifice/ebo of Ifa/Yoruba religion are offered to the Orisa’s as a result of divination. Ifa structures Orisa worship; the randomness of the system ensures that all the Orisa’s are duly venerated. Through Ifa, the balance of the sacrificial relationship between heaven and earth is maintained, for Ifa, through Odu (word of God), provides human beings with information about their place in the world, their destiny, and what the God’s require of them. Ifa and the ceremonial life that it generates constitute the organizing principle of the traditional Yoruba religious vision. It is a view that finds human destiny “rooted in the breath of God Almighty”. Nothing happens by chance. There is a reason for everything, and it is the duty of human beings to recognize this mystery. Within the Odu lay the hidden messages of the unseen influences. These messages are best interpreted by a well trained Babalawo during a divination session. This high system of virtue held by hundreds of thousands of Yoruba men and women survived the middle passage to the America’s where they (we) were taken as slaves. The deep-rooted virtues, expressed in each Odu, sustained the African through one of history’s darkest hours. Continue this cyber journey if you must, as we shed light on the virtues and power (Ase) of the Odu. This is an insert from the holy Odu Irete-Ogbe. Let this page shed some light on the Orisa called Odu. You trample upon the brush. I trample upon the brush. We trample the brush down together. Ifa was consulted for Odu by these Awos. They said, Odu is going from heaven to earth. Whenever she arrive on earth. They said, thee Odu, this is your beginning. Olodumare gave her a bird. She took this bird with her to earth. Aragamago is the named that Olodumare gave this bird. Aragamago is the name that Odu’s bird carried. He said, “You Odu, any undertaking upon which you send this bird, it will do. He said, “Any place that it pleases you to send this bird, it will go. He said, Anything that it pleases you to tell it to do, it will do. Odu brought this bird to earth. Odu has said that no other person will be able to look upon it. She said that it must not be looked upon. With the power of this bird, she will blind the eyes. If another of her enemies peers into the calabash of this bird. This bird Aragamago, will shatter their eyes. She used this bird thusly. She used it even to get to the house of Orunmila. Orunmila went to consult his Awos. The Oracle said, “If we teach intelligence to someone, his intelligence will be intelligent. The Babalawos of the house of Orunmila consulted Ifa in order to know the day that he would take Odu as his wife. In this manner Orunmila would take Odu for his wife. They said, Odu that you wish to take for your wife. A power is in her hands. They said, because of this power Orunmila must make an offering to the earth. In the interest of all of his people. They said, so that with this power, she will not kill and eat him. When Orunmila had made the offering, they consulted Ifa for him. Orunmila carried the offering outside. At the arrival of Odu, she found the offering in the street. Hee! Who has made this offering to the earth? Because he wishes to marry you Odu. All the things that Odu carried behind her, these are the bad things. She told them to eat. Odu opened the calabash of Aragamago, her bird, to the ground. She told it to eat. When she had entered the house, Odu called Orunmila. She said, her powers are numerous. She said, but she did not wish that they should fight with him. She said, she did not want to fight with Orunmila. She said, even if someone asked her help, asked her help to fight him, she would not fight him. Because if Odu did not wish that Orunmila suffers. Otherwise, if they wished to make Orunmila suffer. Odu, with the power and with the power of the bird, would fight the people. When Odu finished speaking thusly. The time came, Odu said, Thou Orunmila, You are going to learn my taboo. She said, she wish to tell him her taboo. She said, she did not want his other wives to see her face. She said, that he should tell all of his other wives that they should not look at her face. Whoever looked into her face, she would fight. She said, she did not want anyone to look at her appearance. He then called all of his wives. The wives of Orunmila would not look at Odu’s face. She said, with him she would make his burdens good. She said, she would heal all things. She said, anything that he causes to go wrong, she would repair it. She said, if he observed his taboo. She said, all things that she completed would be good. Anyone who would disturb them, she would in turn disturb them. If Oso (sorcerer) wished to destroy. She said, she would leave him nothing. Then he himself would be destroyed. All his children, who are Awo. He will implore them that they should never dare to trifle with Odu. Because Odu is the power of Awo. He said, if the Awo possesses Ifa, he will also have Odu. The power that Odu gives him says that. No woman must look upon her form. From this day no Babalawo is complete without possessing this Odu. One who does not have Odu will not be able to consult Ifa.